One of the key factors for our project is that the client is almost 80+ yrs old in business. There are multiple products with different variations of it in the market. Now one of the task/session was to understand their product space, their groupings and how they differ from each other. For understanding product and its family and how they differ from each other, we (Inception team - Sunit, Amit, Panda and Birinder) came up with a simple idea of creating a “Product Map”. Objective: To understand the breadth and depth of the products and their variations. Duration: 30 min to 1 hr (depends on the # of products and product families) Participants: SMEs and Business Stakeholders Preparation: Create large board with matrix/grid having products on rows and comparison factors as columns. Write down all the known products and comparison factors on stickies to save time. Discuss comparison factors, against which the products need to be compared or studied. Few options to consider are, 3.1 User base for the product 3.2 Process steps/work-flow the product goes through 3.3 Numbers related to product, such as revenue, time factors etc. Start with most popular product first and considering it as the base, discuss the variations in other products in the same family. Put notes on small stickies for each variation discovered. Can be used for technical debt matrix e.g. put different modules/areas of codebase as rows, technical parameter such as complexity, test coverage, clean code etc as columns and start populating matrix. Can be very useful for creating visuals for legacy codebase. 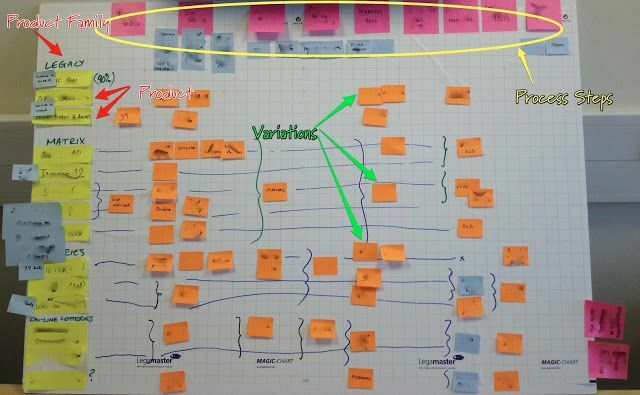 In our case we put products as rows grouped together with same product family (yellow stickies in picture) and different processes steps followed for the product as columns (pink and blue stickies in picture - blue stickies are sub steps). .
We used different colors and size of stickies to show products (yellow), process steps (pink & blue small) and how they differ from each other (orange small).